Mastering the art of snacking is an extremely important factor when embarking on a healthy eating regime whether your goal is to lose weight, increase energy, reduce stress, etc. The quality, quantity, frequency and eating times determine whether snacking will be helpful or detrimental to the successful achievement of your goals. The best snack choices are foods that satisfy your hunger while suppressing the emergence of any rogue cravings that you may have for unhealthy foods. You should choose foods that will fill you with energy and not rob of you of it. You should choose antioxidant-rich foods that protect your immune system rather than potentially damage it. Take pleasure in mixing these snacks together to make a perfect healthy blend. For example nuts, seeds and dried fruit go very nicely together and fresh fruit goes very nicely with yoghurt. Brown bread tastes great with a cold glass of milk - or with a layer of cottage cheese on top instead to create a healthy and tasty open sandwich. Achieving mastery in the art of snacking is the secret to your success so start now! 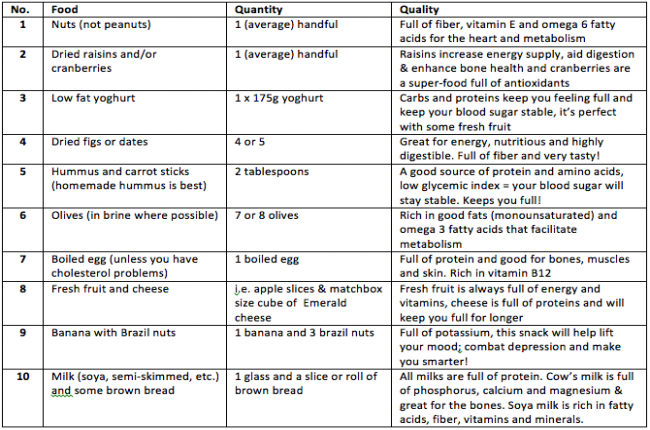 For any additional questions please contact our Nutrition Specialist to make a perfect mix of snacks for you.